Alabama Public Television films Gulf Detectives: Animals of the Northern Gulf of Mexico at Coffee Island. 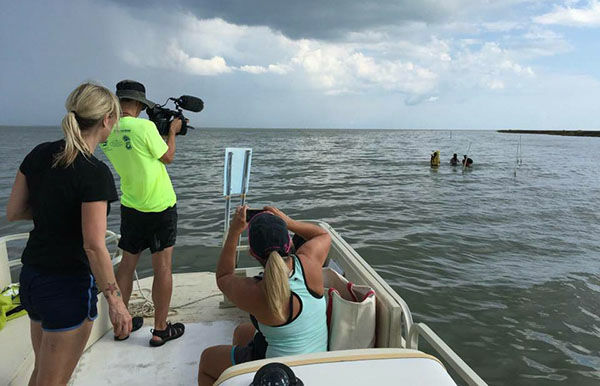 Gulf Detectives produced by Alabama Public Television and filmed at the Dauphin Island Sea Lab earned an Emmy at the 43rd annual Southeast Emmy Awards. Experts at the Dauphin Island Sea Lab guided three young science 'detectives' on a mission to learn more in the interactive field trip Gulf Detectives: Animals of the Northern Gulf of Mexico in October 2016. The student detectives learned about oysters, oyster reefs, and explored the restoration of the oyster reefs around Coffee Island with The Nature Conservancy. They also got dirty in the marsh mud learning about the creatures that live there and how those creatures can help us understand the health of the Gulf of Mexico's ecosystem. More than 62,000 students worldwide participated in the live interactive field trip by asking their own questions and participating in polls. The episode offers teachers a great way to address the disciplinary core ideas in the Life Sciences including From Molecules to Organisms: Structures and Processes; Unity and Diversity; Ecosystems: Interactions, Energy and Dynamics and Earth and Human Activity. Students will see examples of animal habitats, animal adaptations, food webs, and ecosystems, as well as human impacts and potential solutions. A live encore of Gulf Detectives: Animals of the Northern Gulf of Mexico will take place July 26 via APT's IQ Learniing Network. You can sign up to participate in the summer field trip here. This is the second award for Gulf Detectives. Earlier this year, APT's production team brought home a bronze Telly for Educational Media.